This article argues that governments have a constructive and necessary role to play in regulating and monitoring social network sites, and uses the social media company Facebook Inc. and its ever-evolving predicaments with privacy as a case study. 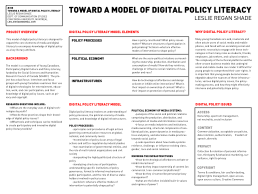 In this poster, a model of digital policy literacy is described. The model is designed to serve as an intervention expanding the core elements of media and digital literacy to encompass digital policy as a key literacy attribute.